When we go fishing, the biggest dilemma we face is choosing what type of fishing pole to use. Comfort always matters and if you just don’t feel comfortable gripping on the pole or using it then that pole is not for you. Fishing poles cast out hooks into the water in hopes of catching a fish. Although this may seem like an easy task, wait till you actually use one. 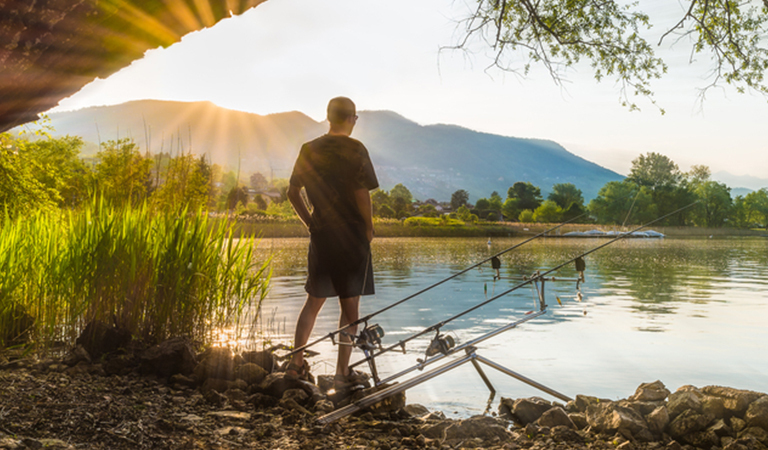 When you do use one, you’ll realize that fishing poles come in a variety of types depending on the material, design, strength, where you’ll be using it and what kind of fish you want to catch. These different types will offer different experiences that new users might find a little difficult to get used to. Keep in mind that you’d want a fishing pole that’s both flexible and won’t break when a fish is caught. Fishing gear for saltwater are usually quite expensive, so when you are picking a deep sea fishing pole, consider the price. 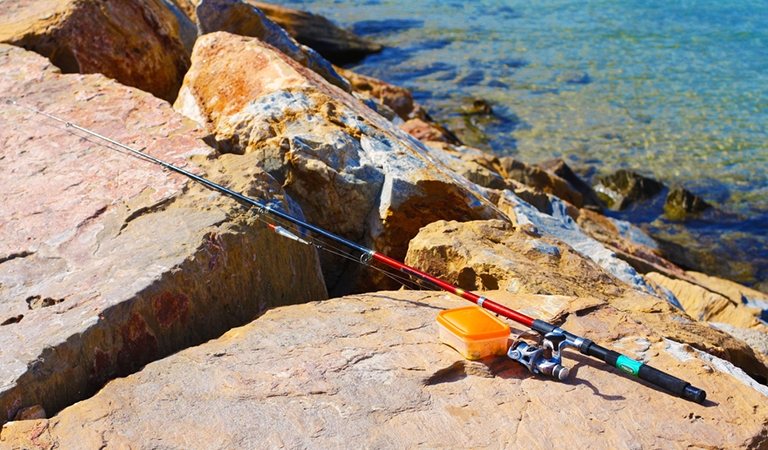 When you are out in the sea, you’d obviously want a fishing pole that does not corrode in salt water. 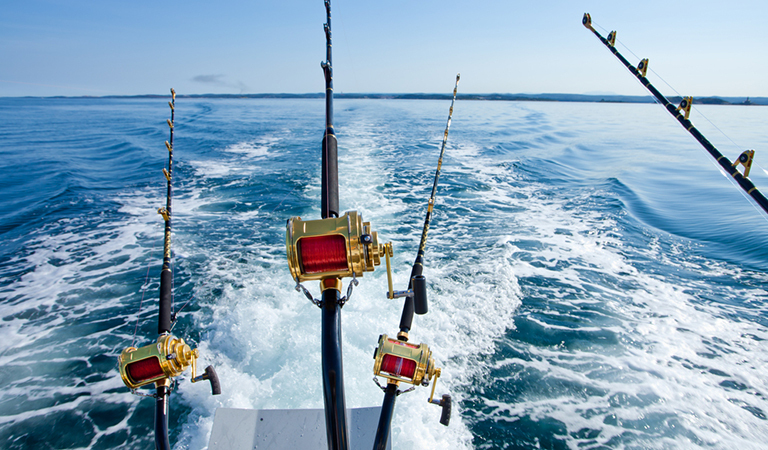 Deep sea fishing poles should be comparatively stronger than other rods because of the possibility of catching bigger fish. They should also be compatible for use in all kinds of deep sea fishing. Trolling is throwing a fishing line into the water while the boat is moving that you can do as well with some trolling tips. Surf fishing is basically standing on the shoreline but casting the rod into the breakers. Inshore fishing is just another term for fishing in shallower regions, closer to the shore. Pier fishing is when you stand on a pier or any other structure to fish on the shoreline. Offshore fishing is exactly what it sounds like. It’s fishing far away from the shore, at least thirty miles far. Ice fishing poles are easily recognizable. They are the shortest in length since there is no need of casting into a hole made in ice. These poles are usually made of fiberglass or carbon, or a combination of both. 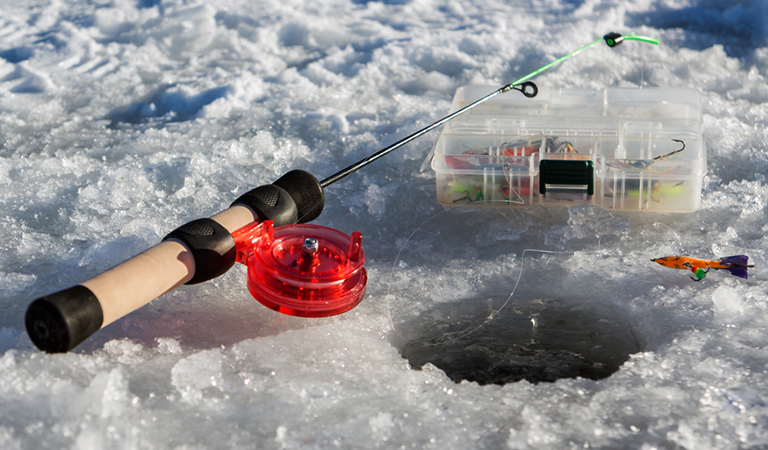 The ice fishing pole you choose will be based on how many fish you can catch. Fish bite lighter in freezing waters, so patience is important too. 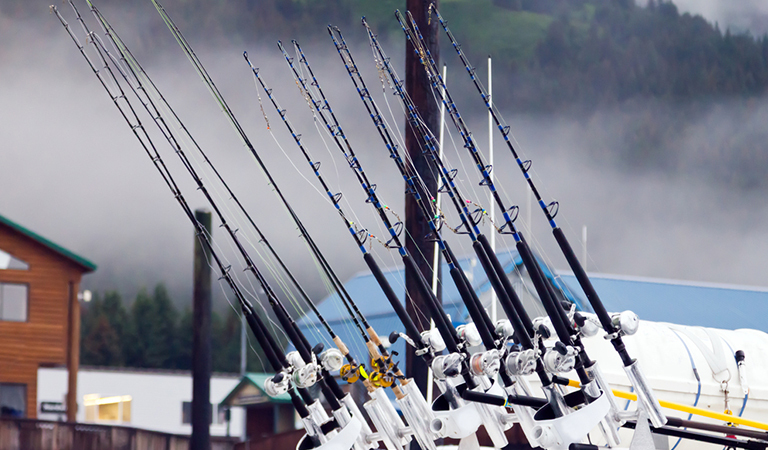 There are multiple kinds of fishing poles with different structures. But if we had to categorize them according to their basic shapes, there would be four groups. Telescopic fishing poles: They can both shorten and expand, which makes them very portable and easy to manage. They’re made of fiberglass, graphite or a mixture of both. When expanding this pole it might get difficult to close it. You should buy one that has more eyes. The eyes provide equal weight distribution throughout the pole so that it can catch stronger fish without breaking. Fly fishing poles: These poles are specially designed to cast artificial flies over long distances. These flies are so light that casting with other rods is difficult. The line gives most of the casting weight. The pole flexibility and size can be managed depending on how far you want the cast to go. You’ll see fly fishing lines are much thicker and more visible. As a result, most anglers use monofilament lines for fly fishing poles. Spinning poles: These poles are easy to use and affordable. You can use light lures and cast long distances with them. Spinning poles, therefore, are very common. Use nylon filaments for spinning poles. Spin casting and bait casting poles: They are almost similar, but the only difference is in the position of the spool. In spin casting poles, the spool is stationary with the fishing line coming in and out at one end. The spool is enclosed and you have to press on a button to release the fishing line. However, in bait casting poles the spool is perpendicular to the reel. When you cast the pole or retrieve it the spool will move. Baitcasting is quite difficult as it takes more skill, practice, and patience. You are probably wondering why there is a separate pole for a specific fish species. There are various types and sizes of catfish and not all poles are suitable to catch them. So when you choose a catfish pole it has to be able to catch all those types! Catfish poles are light. They can easily score any catfish weighing from one to five pounds. They can also handle long-term wear and tear and are generally cost-effective. 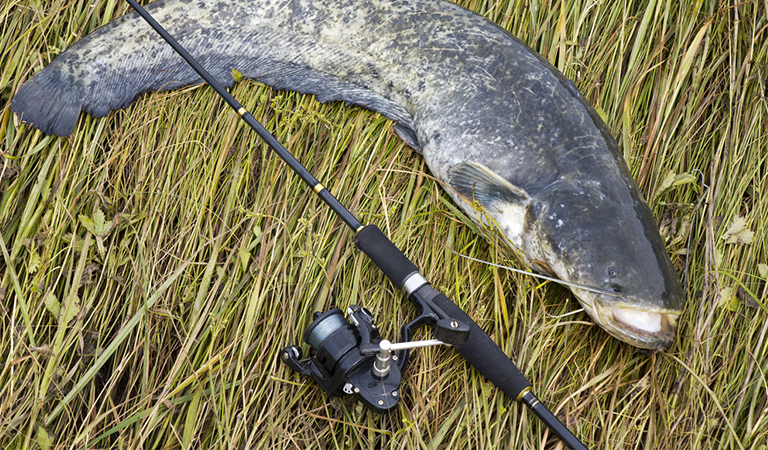 Catfish poles are better with bait-casting reels attached to them instead of spinning reels. You’ll often see that most catfish poles are made of E-glasses. This material helps the pole to be strong, durable and heavy. Some catfish poles could be made of S-glass, which is a superior form of E-glass. Some poles can also be composed of both carbon and E-glass. For catching channel catfish you can use lighter forms of catfish poles, while for the larger ones like bluefish and flatheads you should use composite catfish poles. Yes, mini-sized pen fishing poles are available that are a favorite among kids. These poles are similar to telescopic rods except for the fact that they are extra small. In fact, they are so small that you can easily fit them in your pocket. The pole is encased in a pen-like structure that is around eight inches, hence they are called pen fishing poles. However, they can extend up to 38 inches These poles are made of a mixture of aluminum and fiberglass. You can take your pen fishing pole literally anywhere in your backpack or in your car. Fishing has long been a hobby among fishermen and anglers. In ancient times fishing poles were made from wood, more commonly, bamboo. Even now wooden fishing poles are used in some countries. With advanced technologies, we have moved on from wooden fishing poles to poles made of all kinds of materials possible with easy set-up options. For various kinds of poles, there are multiple kinds of reels, fishing lines and weights available. When you want to set up your tackle box, you’ll have a wide range of lures and baits to choose from. It all narrows down to what kind of fish and where you are looking for. Nothing feels better than catching fish by fooling them and finally being able to eat your prize! But fishing requires some basic knowledge on marine life and perseverance as well. Waiting for fish to bite the bait is more tiring than waiting for a date. The only difference is that your date can ditch you, but your fish will not! 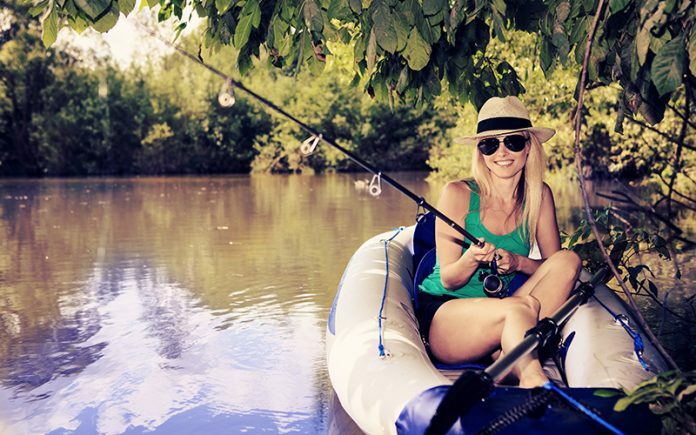 With the right type of fishing pole, you can surely catch your desired fish.